Long Island, New York found itself again at the center of national attention a few weeks ago as presidential candidate Donald Trump made plans to attend a Republican fundraiser in the village of Patchogue, in western Suffolk County, just steps away from where Marcelo Lucero, an Ecuadorean immigrant, was fatally stabbed in 2008 by a gang of seven teenagers who confessed to making sport of committing violence against the Latino community. During the following weeks, I visited restaurants, construction sites and walked the streets of our downtown and neighborhoods talking to members of the community, both Latino and Anglo. I assisted in organizing forums in local houses of worship in an attempt to uncover and discuss frustrations in all segments of the village. I went to the site of the murder, which had become a shrine, and talked to the people gathered there. While these encounters were not always comfortable, I learned a great deal about this tiny village in which I’d grown up and which had almost imperceptibly been changing. For example, I met a Latino man who lived across the street from my mother. I was shocked to learn that he had been there for 23 years. Do we not see them or do they wish not to be seen? My growing belief that leaders have a responsibility to integrate all residents into the community, regardless of immigration status, was underscored. Pontieri went even further and met with the ambassador to Ecuador. He later visited Marcelo Lucero’s home in Gualaceo, Ecuador, and invited that village’s mayor to visit Patchogue and the Ecuadorian community there. More community meetings followed, resulting in the formation of a unity coalition chaired by the New York State’s Commissioner for Human Rights. Sister Margaret Smyth echoes that philosophy. She runs the North Fork Spanish Apostolate, an organization offering language and citizenship classes to the Latino community, along with leadership development and advocacy opportunities. She is the go-to for families seeking to reunite with one another, and usually, all it takes is one call from “Sister Margaret” to employers who are not paying their workers to set them on the right course. According to the Fiscal Policy Institute, immigrants on Long Island make up a “vital fifth” of the economy. A recent study commissioned by the Hagedorn Foundation shows that roughly 18 percent of Long Island’s 2.9 million people were born outside of the U.S and account for about 20 percent of the region’s $91 billion economic output (the combined earnings from work and business). Half work in white collar jobs, and while family income is $80,000 or more for more than 50 percent of the region’s immigrants, as a group they earn 31 percent less than U.S.-born workers. Approximately 41 percent of immigrants overall on Long Island are Hispanic or Latino—although as the study points out, most Latinos are not immigrants. The study estimates that 98,000 individuals are unauthorized, but cites a recent analysis at the state level showing that the number of unauthorized immigrants has been steadily declining since 2004, a trend attributed to the recession and increased enforcement. Within this population, around 72 percent come from Central America, South America, or Mexico. Sadly, Marcelo Lucero was not the first victim of a hate crime against Latinos on Long Island. In the fall of 2000, Israel Perez and Magdaleno Estrada, two day laborers, were lured into a pickup truck by two men posing as contractors looking for help. When they arrived at an abandoned building in Shirley, an enclave about 20 miles west of the Hamptons, the two men dragged Perez and Estrada from the truck and attacked them with a knife, crowbar, and a shovel. Both attackers, alleged white supremacists, were convicted of attempted murder and assault. Two years later, four teenagers in Farmingville were arrested for firebombing the home of Mexican day laborers. And as recently as last summer, also in Farmingville, a Hispanic man was assaulted while riding his bicycle; three men jumped out of a pickup truck and beat him unconscious. When it was announced that Mr. Trump would be attending the Suffolk County Republican fundraiser, Patchogue residents, religious leaders, and community and labor groups sprang into action. Gathering outside the venue where the event was scheduled to take place, they demanded that the event be cancelled. On the afternoon of the event, there were several gatherings, some with dozens of individuals, and one decidedly anti-Trump crowd with what appeared to be more than 100. They took place around a five-block radius encompassing Village Hall, the library, the train station and the Emporium, where Mr. Trump was scheduled to speak. Groups kept to their own spaces and security was heavy. In front of the venue, a group of anti-Trump protesters stood across the street from his supporters, who were waiting eagerly for his arrival. 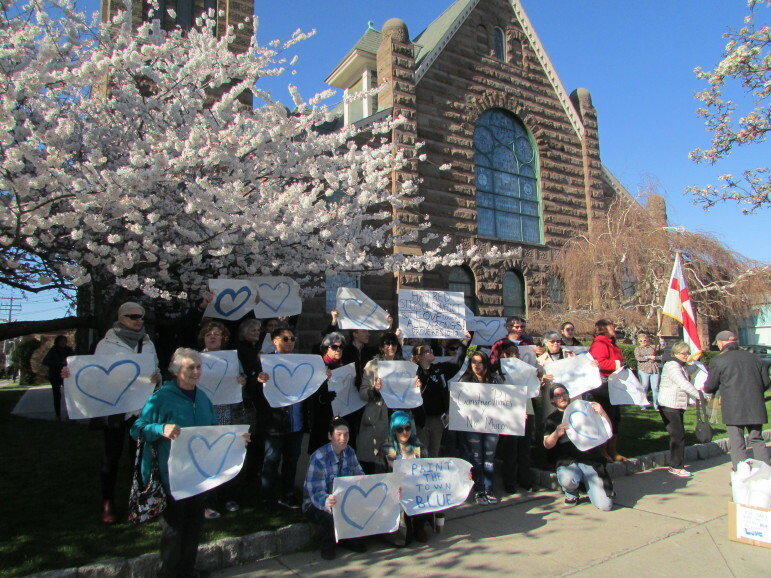 Outside of the Congregational Church of Patchogue on Main Street, a group of religious leaders watched a peaceful vigil conducted by local residents holding signs painted with blue hearts and quotes from Scripture to honor the memory of Marcelo Lucero. Either the organizers are ignorant of the days when there appeared to be open season on immigrants—especially day workers and their families—or the entire event is designed to reignite the hatred that existed and use it for political gain. Following the fundraiser, Mr. Trump, when questioned, claimed that he had not heard anything about Marcelo Lucero or the planned protests. Suffolk County, meanwhile, gave more votes to Trump, at nearly 70,000, than any other county in New York State. According to Newsday, Mr. Trump embraced LaValle on the way up to making his victory speech and thanked him. “You told me you’d be number one for me and you delivered,” he reportedly said. This event and the ripples it creates in the larger community will come and go, and people in Patchogue will return to the mission of maintaining a delicate balance among its diverse citizens. For the Latino community on Long Island, and indeed across the U.S., the ripples these and similar events create are a continual reminder of their tenuous status and marginalization. Joselo Lucero is an outreach coordinator for the Hagedorn Foundation on Long Island, where he is active in empowering youth to stand up against bullying and hate crimes. Because of the tremendous efforts that have taken place around advocacy and coalition building, he believes people feel confident that there are a lot of groups looking out for them. “But on Long Island, there is still much fear and uncertainty,” he says. And he believes candidate Trump’s message on immigration and “building a wall,” only serves to heighten that. Suffolk County would propose a bad law or proposal, and activists would react to that. Ten years later, we’ve come a long way. There are still plenty of things to react to but, in part because we have a new county exec who is much more inclusive to immigrants, we’ve seen a real change. From the onset, a funding strategy was put in place that concentrated on base building, media and communications, litigation and inclusion. According to Sandra Dunne, the foundation’s program director, research, such as the Fiscal Policy Institute study, has also been critical, designed to “prevent folks from throwing out numbers or assumptions that aren’t, in fact, valid” (such as the trope that immigrants consume a disproportionate share of resources). A key ally in the foundation’s strategy was the organization Latino Justice PRLDF, which, Dunne says, “has settled or won every lawsuit they’ve taken on on Long Island.” In the mid-2000s, they fought for day laborers’ rights to look for work on Long Island’s east end (the “Hamptons”) as well as in Oyster Bay on Nassau County’s north shore. In 2011, the Long Island Civic Engagement Table was created to build a common platform of economic and racial justice on Long Island. Since then, canvassers have contacted more than 100,000 Long Island voters of color, educating them about local issues, registering more than 15,000 voters, and coordinating campaigns on redistricting, immigration reform, police reform, language access, and other issues. In 2013, the Department of Justice forced the Suffolk County Police Department to institute new policies to ensure nondiscrimination in providing services to the Latino community, and in 2015, Latino Justice joined with advocates, community organizers, and families who had been victimized by police misconduct to launch Long Island United for Police Reform, calling for accountability, oversight, and transparency along with an end to bias-based police practices in Nassau and Suffolk counties. In January of this year, the group called on the DOJ to investigate the Suffolk County Police Department after jurors found one of its sergeants not guilty on charges related to targeting Latino drivers and robbing them of money, an alleged “stop and rob” scheme corroborated by dozens of victims who have come forward. On April 18th, the U.S. Supreme Court began hearing oral arguments in U.S. v. Texas to determine whether they will unfreeze two of President Obama’s executive actions: Deferred Action for Childhood Arrivals and Deferred Action for Parents (DACA and DAPA). As we wrote here last fall, these two measures, which affect four million children and parents of children without documentation who have lived in the U.S. since 2010, would allow them to remain in the country for three years if they meet specific criteria. Under both actions, decisions are to be made on a case-by-case basis, approval can be revoked at any time, and the measures do not guarantee a path to permanent U.S. residency or citizenship. Individuals can get a Social Security number and a green light for employment, and would be eligible for Social Security benefits after paying into the system for ten years (as is the requirement for citizens). People who get deferred action will be considered “lawfully present.” Under current law, many categories of lawfully present individuals are not eligible, generally, for SNAP (what used to be called “food stamps”), TANF (what used to be called “welfare”), SSI (Supplemental Security Income), CHIP (the Children’s Health Insurance Program) or Medicaid. People with deferred action are eligible only for Medicaid emergency services. However, states have the option to provide, with their own funds, CHIP and Medicaid to children under age 21 and/or to pregnant women. The Obama administration specifically excluded people who obtain deferred action from participating in Obamacare (health insurance, including subsidies, available under the federal Affordable Care Act). As of this writing, the Supreme Court is evenly split, and because it is unclear whether a ninth Justice will be approved any time soon, DAPA’s future is very much in question. While the Court toys with such questions as “whether one can be lawfully present, and yet, be present in violation of the law,” we’ll give the final word to Juan Antonio, an agricultural worker on Long Island’s North Fork, who came to the U.S. from Central America 16 years ago. He was invited in late March by Sister Margaret to speak to a group of foundation funders who had gathered at the Baiting Hollow Vineyard, part of an Island-wide learning tour to meet with local nonprofit leaders and hear from their constituents. He spoke eloquently about his experiences.